The astronomical prices of some current gear can overshadow the increasing number of moderately priced components that produce really enjoyable sound. Today’s sources include a number of digital and wireless devices, and many integrated amps now include DACs and Bluetooth capability that permit you to connect with almost any source you want. Such is Rotel’s $1299 A14 integrated, which produces a useful 80Wpc in a compact, easy-to-use package. Analog fans are not forgotten; the A14 also includes a moving-magnet phono input that’s surprisingly good-sounding. Using an AKM DAC chip, the A14 can play PCM files up to 384kHz/24-bits, and DSD256 files—just about everything you’d encounter except MQA files. What sets the A14 apart is how sweet it sounds, belying the notion that solid-state amps must be harsh or edgy. Yet it generates surprising upper-bass impact from the bass-shy KEF LS50 speakers. Soundstaging is among the best I’ve heard—from anything. Its headphone amp is also respectable, driving fairly low-sensitivity ’phones to decent levels. A matching CD14 CD player is available, which can be controlled by the A14’s remote. If you’re into hi-fi for musical enjoyment, the A14 may be all the electronics you’ll ever need. The centerpiece of Audio Research’s new Foundation Series of components, the $7500 LS28 is a full-function linestage that combines ARC’s latest styling with its usual boatload of useful features. A hybrid circuit (JFETs and 6H30 tubes) produces wide-open, spacious, detailed, amazingly quiet sonics, while adding a robustness to the bass that improves on the LS26 and LS27. All features, including a timer that tells how many hours the tubes have been used, are accessible from the metal remote control. The LS28 illustrates how an expensive component can still be a sensational value. 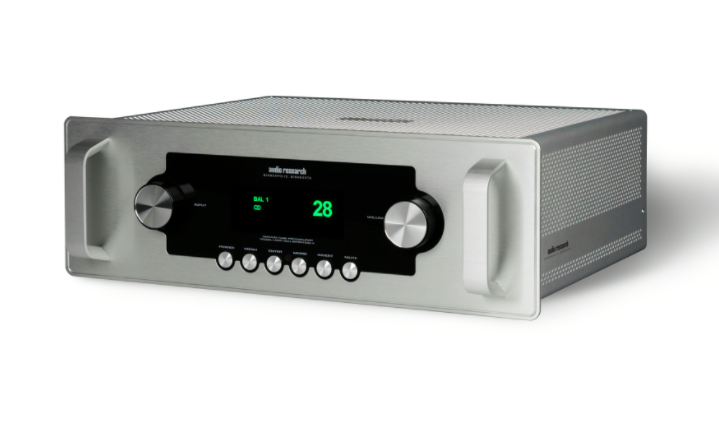 The Foundation Series includes a matching DAC, phono preamp, and power amp.